This modification is a standalone part of QazUI that changes how decks are selected in game. The deck selection panel is moved to a better location, making deck selection easier while chatting. This standalone version is designed for those who like to use an alternative UI but still wish to use this modification. Please note that you do not have to install this modification if you already use QazUI or Low Lag Homecity mod, since this is already included in them. Selecting a deck - Note that you can use this mod alongside with any UI. You can download the Deck selection mod here. The package contains a readme file with installation and uninstallation instructions. 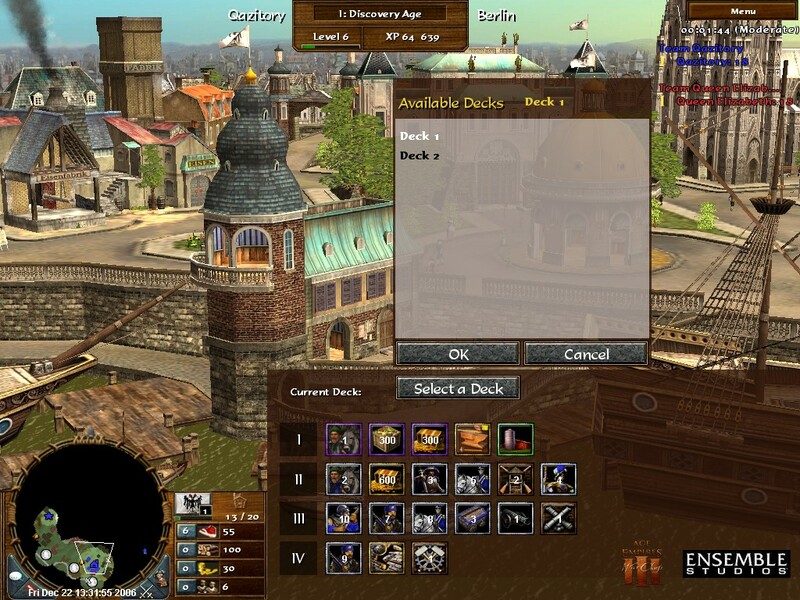 Deck Selection mod is based on Ensemble Studios' file versions. If you have other UIs installed, this will change the way homecity is displayed but it should not affect any other functions.